Seeing a frogmouth during the day is always an event every birder will remember for a long long time. 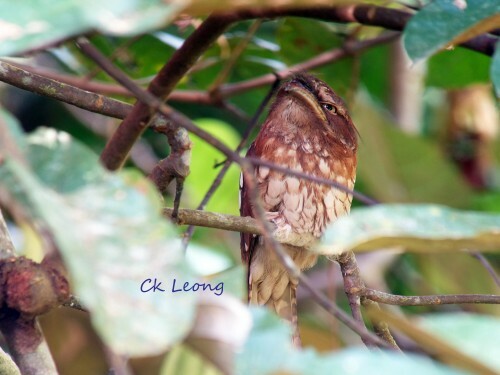 In June this year I had such an opportunity at Tabin Wildlife Reserve to see this nesting Gould’s Frogmouth Batrachostomus stellatus. It was my first proper sighting of this species and it was so wonderful. The bird was sitting on the nest which was so tiny and almost unseen, on a low branch about 2 metres off the ground. I digiscoped this photo from the opposite side of the road. Thanks to Tabin Wildlife Resort and staff for this great sighting.